When the countdown is finished, and the ball in Times Square has dropped… when the fireworks show is over, and the champagne bottle is empty… when the last kiss is given, and the final stanza of Auld Lang Syne is sung… what do you do next? You’ll be tempted to reflect. It’s okay to look back and take stock, enjoy a sweet recollection of a good time, review a lesson learned from a difficulty you faced, but you don’t want dwell in the past. The new year reminds us that time is moving forward, and so should we. As businessman, Michael Altshuler says, “The bad news is time flies. The good news is you’re the pilot.” Honor the past, but prepare yourself to meet new people, go on new adventures, and make new memories. Staying focused on the present and living in the now is a habit that will serve you well. Too often we allow ourselves to recall past mistakes or missed chances. Letting negative thoughts occupy your mind only works to depress your good feelings. Conversely, worrying about the future only serves to waste your time and make you feel anxious. Whenever you find these types of thoughts creeping into your brain, train yourself to immediate return your thoughts to the present. When you focus on what you can do today, you will get more done, you will move closer to your goals, and you will feel better. You may want to take the advice of Tom Peters, the author of In Search of Excellence, who says, “Celebrate what you want to see more of.” In other words, do that which makes you feel good about yourself. With the new year, expect to see new obstacles and challenges, but for 2019 make a conscious decision to see them as opportunities instead of crises. It’s fascinating that in the Chinese language, the symbol that is used for the word “crisis” is also the symbol used for the word “opportunity.” Crisis and Opportunity are in essence simply the opposite sides of the same coin depending on your perspective. When you can look for the opportunity in every crisis, you will prosper. A new year is a time to renew, refresh, and rejuvenate. And, a great place to do that is right here at OHI. Begin your journey of the next 365 days with your special community of loving supportive people. 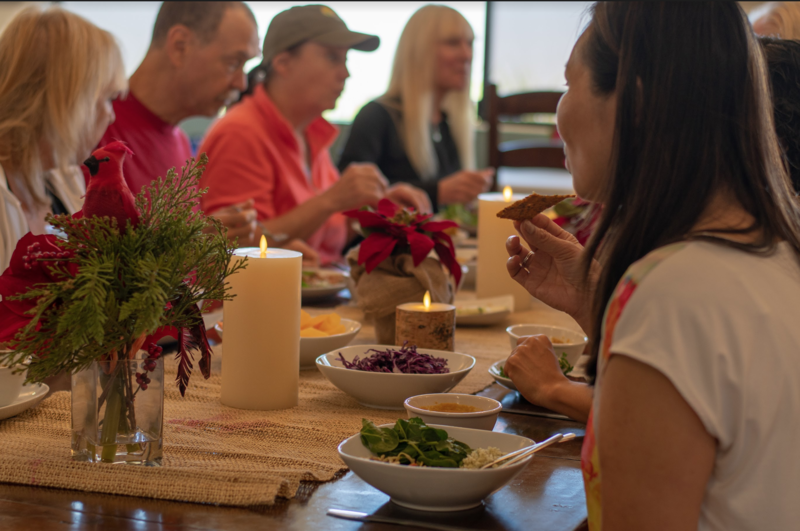 Start your new year off right by honoring your body, mind, and spirit with our yoga classes, delicious recipes, and the heartfelt camaraderie of the OHI community. 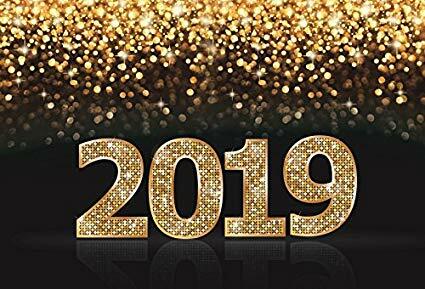 As we say goodbye to 2018, we at OHI thank you for giving us another great year! We’ll be sharing lots of hugs here on New Year’s Eve, and we’d love it if you would join us in the celebration. Imagine What It’s like to Have a Health Opportunity, and No Place to Turn? Rhonda Yeoman was just such a person. In the Fall of 2017 she weighed over 300 pounds, and was diagnosed with cancer. Her naturopath guided her to lose weight and eat a vegan diet. He also recommended OHI, but high medical bills made it so she could not afford it. By August this year, she had lost 80 pounds, but was still struggling with health opportunities, so the naturopath sponsored her for a week at OHI. Ms. Yeoman responded dramatically to our classes and teachers, she said, “It was so exciting, and a privilege to be with a whole family of people who want to heal!” But because of her medical debts she could not complete the three week holistic healing program. Guests Like You Helped Rhonda Succeed! Here’s where our guests came to the rescue – their donations made it possible for her to attend two more weeks! Today, Rhonda has lost over 100 pounds, and her tumors have stopped growing. She says, “I’ll never forget the gift of scholarship for the rest of my life. Because of OHI, I now have a different respect on what my body is doing for me.” Rhonda has become an outspoken cheerleader for OHI, and has even been invited to speak at a conference on natural healing alternatives where she will share her OHI experience. What Does OHI Mean to You? As you reflect on how OHI has touched your life, please consider how our healing mission has made a difference in the lives of those who cannot afford our program. The OHI Scholarship Fund, has made it possible for people with life-threatening health opportunities to begin the process of healing body, mind and spirit. As the year comes to a close, would you consider helping with a tax-deductible gift that will help even more people next year? When Gina Klingelhoets learned she had breast cancer, she realized she needed supportive people in her life to help her get through this health opportunity. However, her solitary job as a medical researcher rarely put her in contact with people, which meant she didn’t have anyone to draw on from work. When she received her diagnosis, her holistic wellness coach recommended OHI. She then told her mother. Upon hearing the news, her mother was immediately ready to provide support to Gina. She even signed up for the OHI program where they shared a guest room and bath. Then as Gina found herself warmly welcomed into our community – the open communication, the love, the acceptance – she felt her relationship with mother growing stronger as well. Gifts, from guests like you, not only helped Gina with her health opportunity, but it also helped her grow emotionally and spiritually so that she was able to bond with others like never before, and to develop deep and meaningful relationships. You see, guest donations truly help people heal body, mind and spirit. And, these are just two of the amazing stories of the many people our guests have helped with their contributions to OHI. As you remember the spirit of peace, love, and camaraderie that you felt here at OHI, please remember those who have life threatening health opportunities and need financial assistance. The OHI community relies on acts of kindness and generosity from people like you to support those in need. Last year your donations made it possible for OHI to provide 97 scholarships. This year we’ve increased our goal significantly. Word has spread of the good work we’ve been doing, and many more people with serious health opportunities are reaching out to us for help. Our goal is to provide 350 scholarships which means we must raise $500,000 by year end. Your backing will make this vital effort possible. And, as the year comes to a close, I am asking you to help out with a year-end, tax-deductible gift that will help even more people next year. Celebrate Your OHI Community with a Contribution Today! Since 1976, friends of OHI like you have helped thousands of people like Rhonda and Gina. And, since all of our scholarships are for people who otherwise could not afford our program, their healing has been possible because of our guests’ generous support. Thank you. Would you be willing to make a special year-end gift today of $50, $100, $500 or whatever you can afford to help hundreds of people with life-threatening health opportunities? Your tax-deductible gift will be IMMEDIATELY put to use providing needed scholarships. Thank you in advance for your kindhearted assistance. There are people who prepare for Christmas all year long. Yes, those early shoppers who put the rest of us to shame, but there are others who take it to a much higher level. People who spend the entire year crafting hand-made presents and decorations, planning parties, designing recipes, and writing holiday cards and newsletters. Then, as December 25th grows closer they start decorating, baking and wrapping. That is great if you don’t have to work and have little children in your life. But, for the rest of us, who don’t have any elfin blood in our genealogy, Christmas comes just once a year. A great way to enter the holidays is with an empowering affirmation. I am free to choose how I spend my holidays. It is okay to take time for myself this holiday season. This year I will celebrate what Christmas means to me. Most of us will begin to feel the Christmas spirit some time after Thanksgiving Day. For some it will be the scent of a fresh cut fir tree. For others a favorite Christmas song will get under their skin. Perhaps it will be the pleasant tones and rich voice of Nat King Cole singing, “Chestnuts roasting on an open fire; Jack Frost nipping at your nose;” that gets you in the mood. While OHI is Christian-based, we embrace all faiths and beliefs. We believe the spirit of the season is best summed up by the words of Jesus when he said, in Mark 12:31, “Love your neighbor as yourself.” We embrace that spirit by creating a giving and loving community that shares care and support during the holidays, and throughout the year. It’s that ‘love of kindred’ that is the true magic of the season. The gathering together of friends and family; the connecting with our community that proves what the season is all about. Many Hollywood movies have attempted to capture this magic, but one has done it so well that it has become a classic. George Bailey, in the movie, It’s A Wonderful Life, constantly helps other people, often to his own detriment, causing him to forego his personal goals and dreams. What he doesn’t realize is that, over the course of his lifetime, he has built an incredibly loving and supportive community. Then in a moment when his world starts to fall apart, his community comes to his rescue and saves him in his time of need. At OHI, we understand that kind of community. We create it, add to it, and reinforce it every week of the year. We would love it if you would spend your Christmas with us. Here at OHI you will enjoy a peaceful and harmonious holiday with loving and supportive people. When you spend your holiday at OHI, you’ll be eating the delicious clean foods that energize your body. And, you’ll be maintaining your healthy lifestyle in a nonjudgmental and caring community. And, in the giving spirit of the season, bring your friends. What better way to enjoy the holidays than giving the gift of healing body, mind, and spirit to those you love. Seattle resident Rhonda Yeoman knows drastic change takes drastic measures. A decade ago, when she had a major thyroid problem, a skilled naturopath got her on the right path. When Rhonda’s naturopath relocated to Texas, Rhonda reverted to her old habits. Her health gradually declined as both her diet and exercise habits deteriorated. When Rhonda received a cancer diagnosis last October, she immediately flew to Texas to again seek her naturopath’s sage advice. At that point her scales registered over 300 pounds, and she realized she was sabotaging her health and her life. The naturopath himself had previously been diagnosed with prostate cancer, and shared with her how multiple visits to OHI helped him. She wasn’t sure yet if she wanted to try OHI, but she did drastically change her food plan. Rhonda kicked her meat-at-every-meal routine in favor of a plant-based diet. that she could benefit from OHI’s holistic healing program that he offered to sponsor a week-long visit. Since crushing medical debt made it impossible for her to afford completing the entire three-week holistic healing program, Rhonda says she’s eternally grateful for the OHI Scholarship she received. “Each week is a different feeling,” Rhonda said, “And it gives you a new sense of awareness. The classes and activities are mapped out so smartly — the whole experience is so intelligently designed with every single layer of the human spirit in mind.” She shed additional pounds during her 3-week stay as her body, mind and spirit came into balance. Today, Rhonda is living her life more fully and joyfully than she ever imaged possible, thanks to generous donations to the OHI Scholarship Fund.